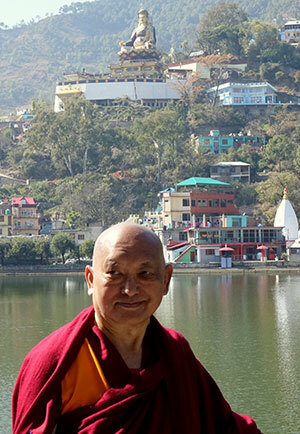 During the last month, Lama Zopa Rinpoche has been in Tso Pema (Rewalsar), India, receiving rare oral transmissions on vinaya (monastic discipline) from a Kagyü abbot at a monastery there. Rinpoche also did some personal retreat, circumambulated the lake regularly, and visited all the amazing holy sites there, including the 110-foot (34-meter) tall Padmasambhava statue that overlooks the lake. Photo by Ven. Roger Kunsang, February 2016. 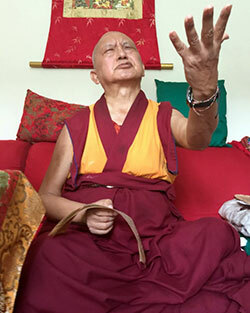 Lama Zopa Rinpoche recorded a Losar message for us all! Watch it here. Lama Zopa Rinpoche during the long life puja offered to him at Kopan Monastery, Nepal, December 2015. A reminder that the annual official long life puja will be offered to Lama Zopa Rinpoche at Amitabha Buddhist Centre, Singapore, on March 13, starting at 9 a.m. Singapore time (SGT; UTC +8:00). The puja and any teachings from Rinpoche will be livestreamed so all can participate. Donations are welcome. Please donate by March 10 if you would like your name included in the list of donors. Contact your local center or study group to help participate in offering prayers and practices for the health and long life of Lama Zopa Rinpoche. 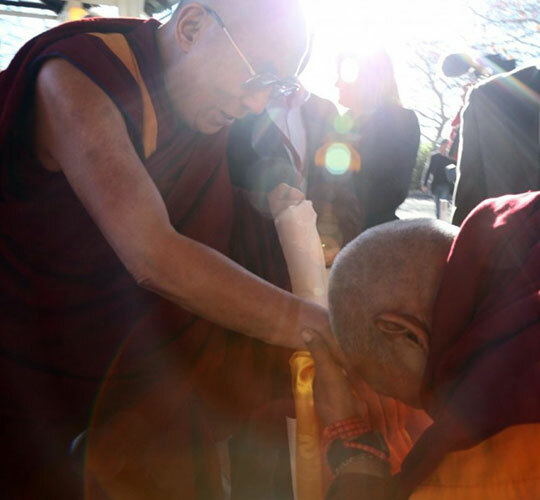 His Holiness the Dalai Lama and Lama Zopa Rinpoche, Blue Mountains, Australia, June 2015. Lama Zopa Rinpoche, New Zealand, May 2015. Lama Zopa Rinpoche in Brazil, September 2015. 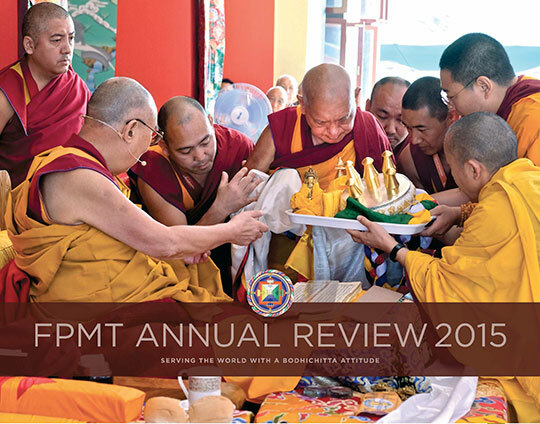 FPMT International Office has recently published our FPMT Annual Review 2015: Serving the World with a Bodhichitta Attitude as a PDF and as an ezine. Inside find important letters from spiritual director Lama Zopa Rinpoche and CEO Ven. Roger Kunsang, in addition to reports on the activities of International Office. We also share inspiring photographs illustrating what we’ve all accomplished together in the last year. Rejoice with us as we continue to serve the world with a bodhichitta attitude! Last year, when Rinpoche was at his home in California, USA, he created a new flower offering card. Rinpoche then had the card made into a 3-foot (1-meter) tall sign, so that when you first enter the extensive gardens around Rinpoche’s house, you read it. The FPMT Foundation Store is excited to announce that a smaller version of this card is available to order! Rinpoche has said that anyone can use this card where there are many flower and water bowl offerings. 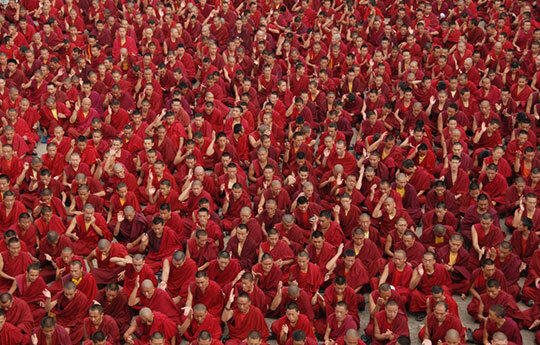 The Puja Fund sponsors prayers and practices offered by up to 15,650 ordained Sangha members on every Buddha Day, when merit is multiplied 100 million times. This year on Losar (Tibetan new year), in addition to the wide array of pujas and offerings, the Puja Fund also sponsored 100,000 tsog offerings by the Kopan monks and nuns dedicated to the long life of Lama Zopa Rinpoche and to purify our karma for Rinpoche to show any aspect of illness. 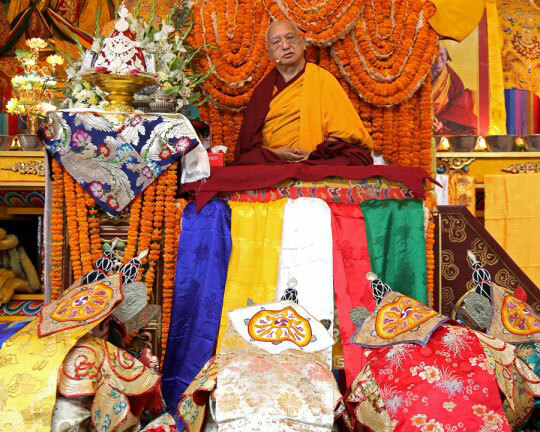 In this way, the Puja Fund has joined in with all FPMT centers, projects and services to help create the karma for Rinpoche’s long, healthy life. All of the completed tsog offerings will be offered to Rinpoche during the upcoming long life puja in Singapore. We invite you to rejoice! The Losar campaign to gain new Friends of FPMT is coming up on its final days, finishing on the Day of Miracles on February 22. Our goal of 108 new Friends will help support our work throughout the year. As our thanks, we provide supporters with access to a trove of complimentary FPMT Education Services materials for study and practice, plus a subscription to all Mandala publications. Join the campaign here. Thanks to all of you who have already let us know how your center, project, service or study group is participating in the practices and long life puja for Rinpoche! We rejoice in all the tsog offerings going on during this auspicious Monlam period. Please let your regional or national coordinator know about your totals. Please refer to our webpage here for more about how to participate! As you know, we are nearing the end of Monlam (15 Days of Miracles), which this year occurred February 9-22. 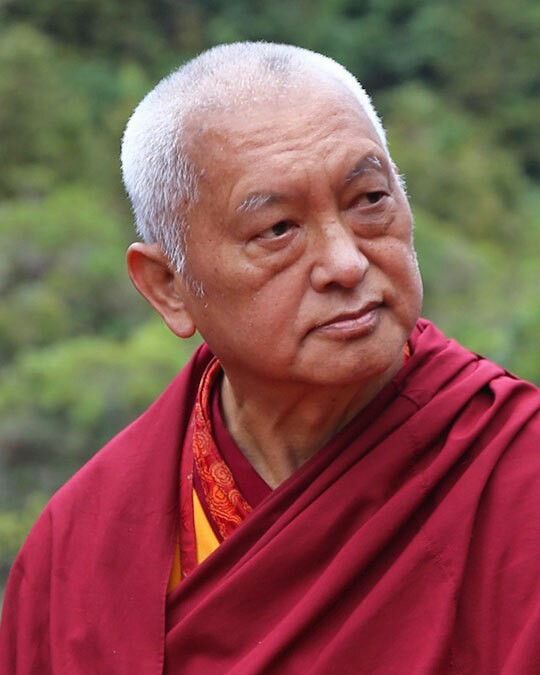 Lama Zopa Rinpoche’s recommended practices for these special days (and others) are collected on Rinpoche’s Collected Advice in the FPMT Affiliates Area. Liberation Prison Project’s calendar of Dharma dates is here. The Teacher Registration Committee has updated the FPMT Teacher Registration Policies, and added a new document, Applying to Become an FPMT Registered Teacher. These documents can be found within Teacher Policy and Information under the Geshes and Teachers section in the FPMT Affiliates Area. Découvrez le nouveau site internet du Service de traduction: plus de 250 traductions offertes en libre téléchargement et une boutique en ligne permettant de se procurer toutes les publications (formats papier et ebook). Vous souhaitez soutenir la diffusion du Dharma en français? Devenez «Ami du Service de traduction» et, contre 108 €, recevez pendant 10 ans toutes les publications du Service au format ebook (déjà 30 titres disponibles). Managing Editor for Education Services at FPMT International Office, US – the deadline for applications has been extended to February 26. Maitripa College, US is looking for a classical Tibetan language instructor. Gendun Drubpa Centre, Canada needs a resident teacher. Land of Joy, UK is welcoming interest from potential candidates for director and spiritual program coordinator. Jamyang Buddhist Centre Leeds, UK is looking for a spiritual program coordinator. Kalachakra Centre, France is looking for a manager for their rural retreat center. Root Institute, India and its projects Maitreya School and Tara Children’s Project has openings for a center services manager, a residential house manager and a project manager.